This is going to be all about roof repair and it kind of hits home for me because the other day I wake up and I look out on my back deck and I see a bunch of these a bunch of loose roof shingles sitting out on my deck. 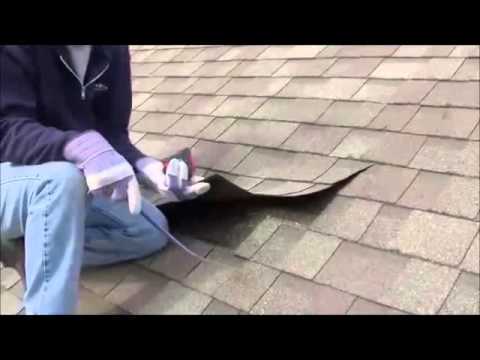 This may happen to you where you know you see a little piece of asphalt roof shingle not sure if it’s yours or your neighbors or maybe came off at your roof but at any rate if you find this there’s some things you need to do right away to make sure that you don’t get a roof leak. So specifically in the video first we’re going to talk about how prevention of roof repairs can be done with proper maintenance. Second how to be proactive in determining the need for a Toronto roof repair and third how preparation for a roof repair can save you a ton of time and money. Okay here’s a picture of one of the shingles that fell off the roof now some things we’re going to point out to you when we get up on the roof now quickly we can see that the nail holes did not hold this shingle onto the roof because the shingle was installed completely out of alignment and none of the tar seals are holding very well. So we’re going to get up on the roof with my craftsmanship and he’s going to point this out to you so you can understand that even a four-year-old roof if it’s not installed properly and not maintained can have problems right away. The nails were kind of holding it’s the wind they got ahold of that yeah where’s you have five and a half inches on this one here and this one was down six and a half to seven inches. They missed the scene by an inch and a half that’s the straight line there they should have followed. see where this one’s overlapping that would have been a straight line. This whole point isn’t sealed properly now here you can see chip pointing out the misalignment of shingles again improper installation now what that leads to is the tar strips on the backside of those shingles don’t line up and therefore once again the shingles will not stick to the roof. Two shingles that were butted up too closely to one another and again they lift up the wind can capture it and they can depart the roof in a storm. An entire row of shingles that is not sealed down and as you can see all it takes is a couple good gusts of wind which chip is simulating here to pick up large sections of your roof and tear them right off. Need to check for any unsealed nail heads this is critical because these nail heads wiggle loose a little bit and allow a perfect pathway for water to get behind the shingle through the sheathing and then create a great pathway to get into your home. These all need to be sealed up and once again lazy roofers didn’t do it when they put the roof on for the first time we’ve gone over the entire roof. This is why you can’t just go out and shop for a roofing contractor as a commodity and just go and shop for the cheapest price because there are so many installation errors that can cause this roof not to last very long. So you know we sometimes joke in our business you know we kind of like these to see these construction defects and these problems because it’s where repair companies like ours get a ton of work. This is why it’s really really important to find a contractor who’s experienced who have craftsmen and technicians who do to job right the first time because you can see on this roof we’re going all over it repaired areas where shingles had just been installed properly and if we don’t do this the roofs gonna leak like crazy and cause all sorts of damage inside the home. Here’s what we’re going to do to fix this roof. it’d be kind of a serve to tear this whole section of roof off. It’s only four years old so what we’re going to do is we’re going to replace the shingles in the area where their shingles missing and then we’re going to apply appropriate seal it in all the areas where the shingles are a little bit of out of line and they’re not sealing down properly.